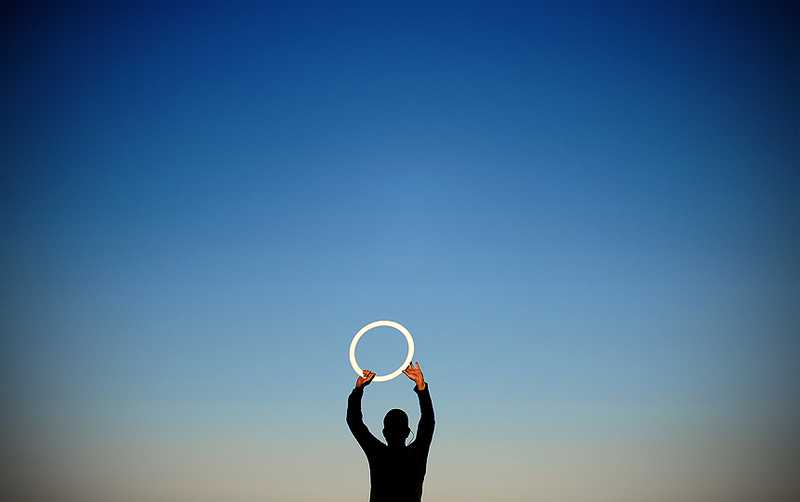 "In front of a large group of passerby, a contortionists shows the size of his ring before attempting a routine in Yamashita Park in Yokohama, Japan on Jan. 3, 2009." Since I've been back from Japan, I've literally (OK, misuse of an adverb, sue me) been making myself jump through hoops to edit through my entire take of images. Its been a long, grueling battle between Photo Mechanic, Photoshop and me, but I am just about done. My problem is that I've been trying to make my book on the trip perfect. Not too many images, not too many pages, and a nice rhythm to the photos. But then, whenever I see a new frame in my edited bin, I start rearranging photos on the pages trying to make a nice juxtaposition. Nonetheless, traveling overseas means taking a lot of photos with fear of never returning. Money is obviously tight nowadays and travel isn't so much a common practice before people starting losing their jobs and finding themselves in finical binds. During my stay, I shot more than 20gb worth of photos, about 4gb a day give or take. Granted, many are just snapshots or scene setters so I could remember where I was (or how to get back to the train station), that is still a lot to edit through with other things going on in my life. But it got me thinking, whenever I travel somewhere unordinary, and when I say unordinary, I mean somewhere out of my daily realm of life, err, out of state or country, I shoot a lot heavier than normal. Yet why shouldn't I think that way on a normal basis? Who knows if I'll ever make it back to dangerous West Baltimore again or even out of bed the next day. Why do we hold back from shooting way too much? Well, I know the logical answer is running out of hard drive space and getting overwhelmed with way too many meaningless frames. But if you think about it, we have virtually unlimited ones and zeros to fill with all of these new large memory cards, inexpensive hard drives and infinite Internet space. One day I'm sure the ways of a photographer will be much different and memory will be limitless. But for now, what real reason do we have to hold back from shooting everything that moves (or doesn't)? Nonetheless, this photo has about zero context, and was taken on a fresh memory card mind you. I am sitting here finishing up my Japan edits this very second and attempting to put the final touches on my book when I stumbled across this frame I snapped during my trip. It won't make my book, but it's a nice clean graphic. At the end of the day though, it's just another frame on the hard drive. Just another frame on the hard drive. 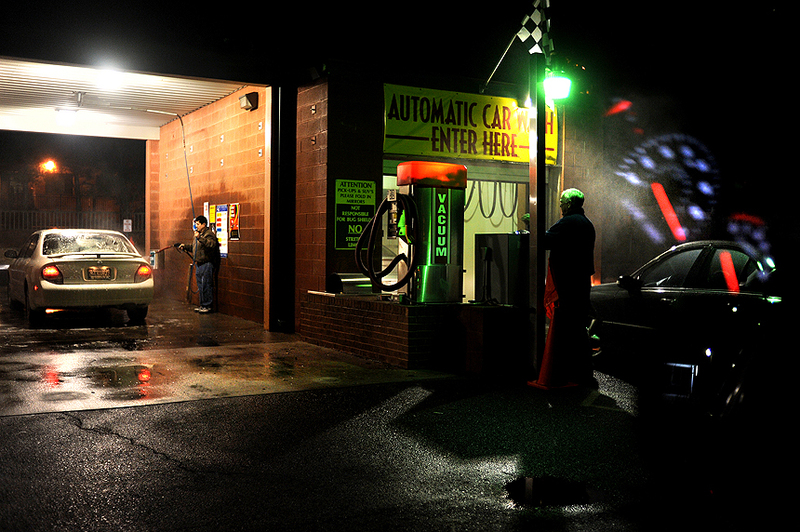 "Following a winter weather system and then a 40-degree day in Maryland, a patron washes the salt off of his vehicle as employee fixes the automated drive-in wash system at a car wash in Cockeysville, Md." Maryland isn't like California. We have a winter that includes low temperatures and snow. Two things Californians know nothing about. Not to mention, we east coasters also own more than just shorts. In contrast, I can see my buddy Darnay saying right now how a Baltimore winter weather system is nothing compared to the snow they get out in Montana. Ha. Whatever. It's all relative. It's all snow, right? Nonetheless, I don't mind snow and winter weather, but that isn't to say I once despised it. Back in high school I was really into cars and my gem at the time was a fully restored Honda CR-X. While I loved the car to death in that era of my life, I couldn't justify driving it the minute a flurry hit the pavement. I was terrified that my defensive driving skills on a snowy day wouldn't be enough to prevent someone from sliding around a turn and totaling this object that I had dumped way too much money into. In addition, anyone who has ever owned a Honda, more specifically an early 90s' model, knows they rust easier than a iron bolt in the rain. So there laid the problem that my Honda iron box of joy would become a rust box with wheels if it came in contact with water and oxygen. Then add some cold temperatures some potent road salt and every panel on my car would rust quicker than children looking out the window when you say, "Look, it's snowing." But now I could careless about my car. After years of parallel parking in downtown Baltimore, my bumpers have more license plate bolt marks than a golf ball has dimples and my doors have more dings and dents than, well, a car in a hail storm. With snow coming in and going out January through March here on the east coast my car becomes subject to becoming very, very dirty and while I don't care, I must still wash it. What happens is the snow falls and the transportation authority over salts the roads to keep us motorist safe. A couple days later everything melts and the roads become a slushy mess of gray water, thus in turn transforming my clean car into a salty mess. It becomes overbearing and why I could easily leave it until April when my hose unfreezes and I can wash my car for free with my own water, I feel the need to sit in the long lines to get my car washed for $8 or more. But immediately after I wash it, it snows again - repeating the cycle. What can you do other than post a random, meaningless rant about it? All I know is when I asked the attendant in the picture above if he owned the wash he smiled and said, "yes." When I asked if he was making a killing on this "warm" day which every Marylander was washing their car, he could only smile and say, "I hope." Here is a quick frame from the car wash that I wasted my money on. And now that my car is clean, all I can say is welcome back snow. "Cheryle Jackson of Cincinnati reacts following the inaugural speech of Barack Obama, the 44th President of the United States of America, underneath the General Ulysses S. Grant statue at the head of the Capitol Reflecting Pool on the National Mall Jan. 20, 2009 in Washington, DC. Obama became the first African-American to be elected to the office of President in the history of the United States." From those I've spoken to, they find it hard to come up with more than single words to describe Tuesday. But we do have some in common: Memorable, perfect, remarkable, unbelievable, and amazing. It's no secret what event took place, no matter where one lives in the world. Tuesday made history with the inauguration of Barack Obama as the 44th President of the United States of America. Obama not only was named the new official president, but also became the first African-American to be elected to the office of President in the history of the United States. From reports, there was expected to be more than 2 million people in Washington, DC for this moment in history, and the media was not far off. More than 1.7 million people squeezed onto the mall. I had anticipated heavy traffic everywhere. No parking and packed metros, so getting there was looking doubtful. Luckily for me, I got to crash with my buddy, Charlie, in his pad up in Georgetown to bypass all that horrendous traffic, steep hotel costs and excessive crowds before Tuesday. On Monday night, Drew, Joe and I rolled down from Baltimore to stay with Charlie (thanks again, man) and get a glimpse of life in Georgetown. We hit The Big Hunt in DuPont Circle, which was a pretty cool bar and dished out some solid wheat beer. The only problem was we stayed out all night and had to get up a 6 a.m.
Fast forward to the next morning after a quick cat nap. After catching a quick cab ride, we got into downtown from Charlie's pad around 7:30 a.m. From there, Charlie had to shoot his assignments, so us three walked around and shot some features before hitting the mass crowds on the National Mall. Somehow, someway, we bypassed the millions of people that crowded every square inch of downtown and walked straight through gates you needed tickets for, including those thousands of people who stood in line in the underground tunnel beneath the Mall and never got in. From what I read, more than 240,000 people were issued tickets. Not us though. We were laughing, yet terrified we'd get the boot at some point and have to start from square one. But somehow we kept creeping closer and closer...and closer. So with no tickets, no press credentials, no special passes, we were the first group of spectators that were able to stand; behind those that had "real" tickets and were seated. 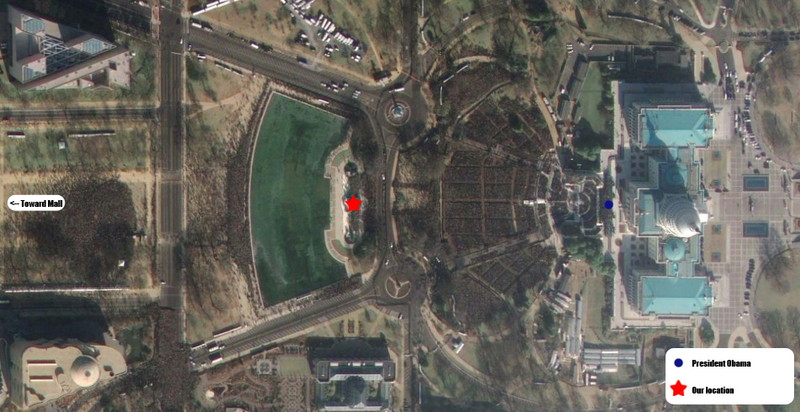 From this satellite image map, you can see were in front of the General Ulysses S. Grant statue at the head of the Capitol Reflecting Pool. Pretty amazing considering when we got onto the mall, every space toward the Washington Monument was packed with people. From that point, we killed a couple hours walking around (trying to stay warm) before Obama was sworn into office and delivered his powerful inaugural speech. I found myself listening and taking in the moment more than shooting. I guess I could since I had no deadline. But it so hard to describe the energy for change. The crowds defied belief. The sheer amount of energy downtown was fascinating. The emotion was evident and people couldn't be happier. Especially when former U.S. President George W. Bush departed by helicopter. I never heard so much booing, hissing, middle-fingers and peace signs displayed in one place at one time. Following Obama's speech, we kept shooting features and walking around. We had been running off of three hours of sleep, no breakfast (or any sort of hydration), no form of heat with the numbing temperatures, and no seats, as we had been standing since 7 a.m. Yet it was all worth it. This was something I'll always remember. Whether it be because it was my first inauguration or because of what this remarkable moment in our nation's history meant to millions of people who had the chance to share that moment live. Amazing. Truly amazing. Here are a bunch of photos from the day. 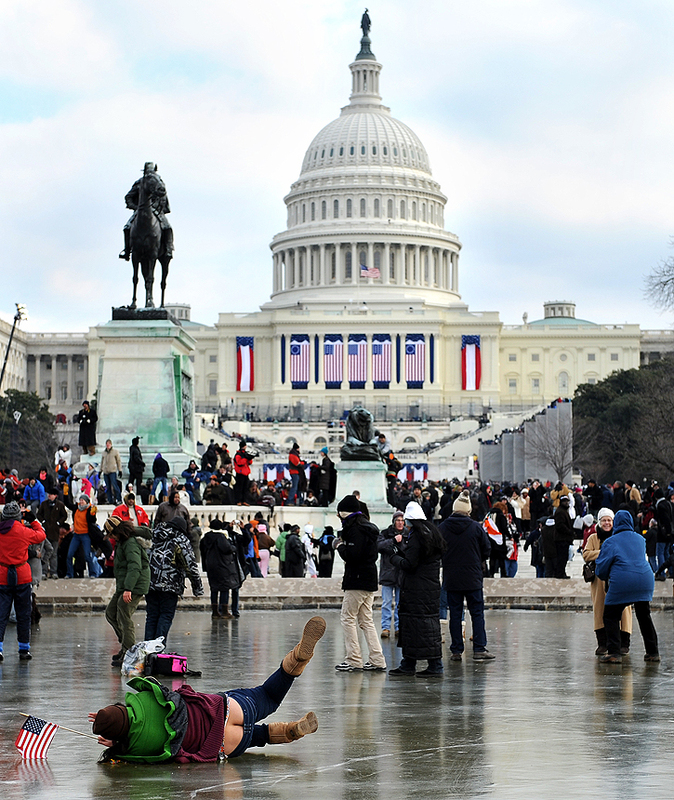 "Following the inaugural speech of Barack Obama, the 44th President of the United States of America, a young girl loses her footing on the frozen Capitol Reflecting Pool on the National Mall Jan. 20, 2009 in Washington, DC. Obama became the first African-American to be elected to the office of President in the history of the United States." Yesterday I had the opportunity to go to the inauguration of Barack Obama, the 44th President of the United States of America, in Washington, DC. I will be updating with a full post tomorrow and may start looking into posting less words and more photos in the future. But right now I am completely exhausted and cold to do anything but post a couple sentences and one photo. This was by far one of my favorite images from the day, and well, for all the wrong reasons. But what can I say, it was a great moment and a nice snag. Anyways, full thoughts and a lot more photos within the next couple days. 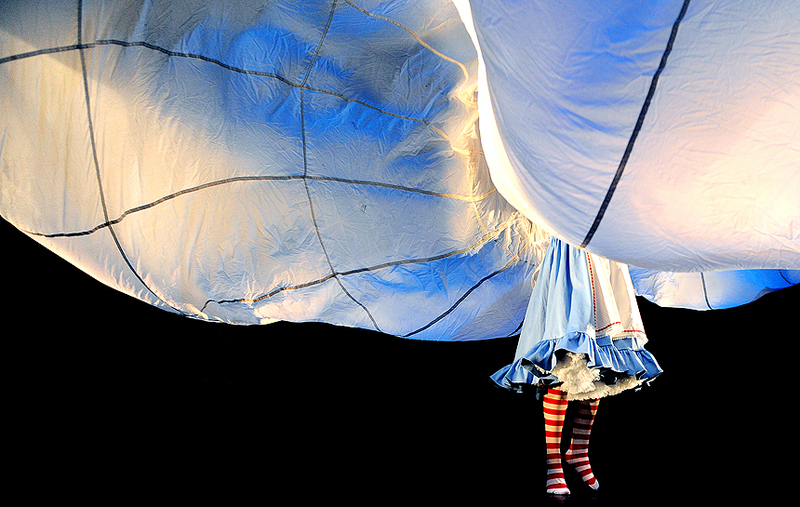 "In a sea of silky, swirling parachute fabric that is being whipped into tidal waves by a cast of eight circling dancers, Caroline Cohen, who plays Alice, rehearses a scene from danceRINK's version of Alice in Wonderland at the Theatre Project. The performance is adapted from a vintage 1950 radio-play." Photographers most of the time know what they are going to get with a performance. Be it a concert or theatrical play, the moments are already written, the lights are focused and it mostly depends on your angle in order to get something unique. When I was in college (why does that already seem like so long ago?) I shot theater performances three or four times a year. New productions typically came out once a semester in the Center for Arts on campus. I had gotten to know some of the directors and staff pretty well and they always treated me good and give me some great access. It didn't hurt that one of my friends had more connections than I did and also worked on building the sets and generating ideas for the lighting design. So whenever I went to shoot opening night or the final dress rehearsal, I found myself dangling from the rafters and making some pretty interesting frames. In December, I got a late night call Saturday to see if I could shoot the final dress rehearsal of danceRINK's version of Alice in Wonderland at the Theatre Project. I took it and was fairly excited to shoot a dance/play again. On my way inside Theatre Project, which I had never been to before, I was thinking of the possibilities of getting some images from the rafters or images that really used the lighting artistically. To my dismay, the studio was small with no catwalks and the lighting had yet to be focused and setup, too. But those two things wouldn't be the only thing to disappoint me. From the minute I walked in, I found out the director to be fairly stressed out and that what I was about to shoot was anything but the final practice. I quickly was informed that this wasn't a dress rehearsal, yet a photo call. In other words, select cast would stand there as I shot photos how the director wanted. I began trying to work with the director, have him reenact some scenes or let me shoot things how I was instructed on my assignment. But I wasn't getting any leverage. Before I knew it, I was being told not to shoot certain people, certain parts of their costume and more importantly none of Alice's feet; no shoes. Racking my brain to be more creative, I started running around like a mad man to get a different angle. I started breaking every rule the director set as well. Before I knew it, it was all over. But I insisted that he have the cast reenact the parachute scene that the reporter had wanted. But I was reminded, "No shoes, remember, we don't have the shoes yet, please don't shoot her feet." At this point, I was simply frustrated. I can't say I did it on purpose, but laying on the ground, I kept seeing the above frame of vibrant blue fabric swirling in my face. The contrasting red and white socks did it for me as I grabbed a frame I knew made the director wince. But in the end, I got what I wanted and probably what the director wanted. Three pictures from this half-hour shoot ran in the paper, including the above which surprised me. Alas, I was actually going to go see the performance after finding out my friend's significant other was in the show, but I feared the director would behead me after he must have said he better not see any below the waist Alice shots in print. Little did I know, he had cut the pages out of the paper and mounted them on poster boards. He loved them. Or so I was told. Let me preface and say that I'll return to my traditional posts, assignments after this quick one. And thanks to Desi for grabbing the graduation shot of me last Sunday. I am almost back in charge of my life. That's right; sleep is no longer ruling my life. Well, maybe I should say lack of sleep is no longer in charge. Since getting home I've been trying to catch up with life back in Baltimore and trying hard to adjust to the jet lag. A 14-hour time difference really kicks your tail end when you get back home to your own bed. But I am surviving and getting back to normal. Speaking of which, my life is no longer ordinary. Since I've been probably five-years-old, I've been enrolled in public school and then college. That has all come to an end. I finally graduated college. Woo-hoo! 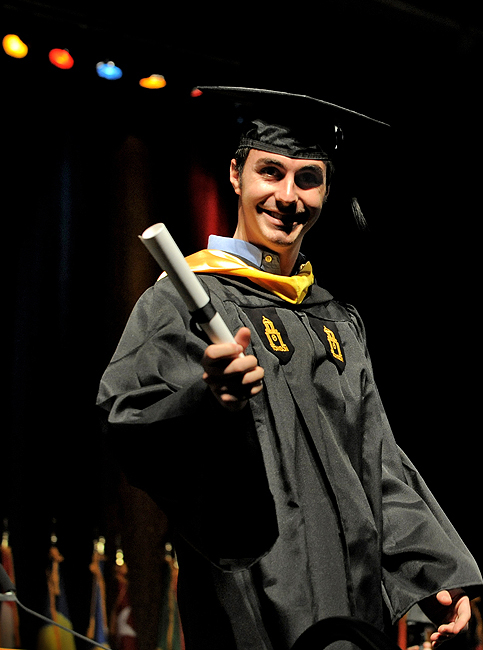 I graduated from Towson University with degree in Mass Communication with a focus in Journalism and New Media. Now that I am done, it feels good; really good. But it now opens a new chapter in my life. I am not quite sure which direction it will go, but I do know no matter where I land it will involve having my cameras in hand, hopefully seeing the world, meeting new people daily and informing people with my photographs. Or so that would be ideal. I guess what I am saying is that I live for photojournalism and traveling. As for now, I am getting back to the daily grind and working hard at scouring through my favorite images from 2008 for contest season. Up until now, I've never entered the prestigious competitions like NPPA's Best of Photojournalism, Picture of the Year International and White House News Photographers Association. I've only entered the competition my campus paper paid for: Society of Professional Journalists. While I pulled in some national awards with that, I always thought I should be going against those I was shooting next to on my freelance assignments. So wish me luck in my contest entries, and more importantly, my future endeavors. Finally, speaking of school. Towson featured me on their Web site back at the beginning of the semester. I didn't really want to be put up on the site, but it is what it is. Check it here. "Pictured is a sampling of my meals in Japan throughout various parts of Honshu and Kyushu in December 2008 and January 2009." No matter where one goes in the world, one of the best ways to get immersed into the culture is to eat indigenous food. While in Japan, I had zero American food, although that can be a discrepancy if you count my Mr.Doughnut chocolate doughnut and McDonald's sandwich I had an hour before flying back to the United States. Little did I know, Mr.Doughnut was once an American staple for purchasing the breakfast pastry. I had believed the franchise only operated in Asia and mainly Japan. Oops. And as for McDonald's, well, I hate airline food, so it seemed like a good idea to eat a McChicken sandwich in Narita's terminal an hour before my 24-hour journey back to Baltimore. Granted, it was literally the last meal I had before leaving the country. Anyways, I made it a point to try and remember to photograph every single thing I ate while in Japan. While I didn't quite remember every time, above is a sampling of what I did pig out to. During my last trip, I was scared to take pictures of my food. I never have done here in the United States and when I did pull out my camera I felt if all eyes were on me, as if they were saying, "Look at that crazy American!" But I got over that quickly this trip. In addition, I realized that one sushi bar I went to in Shinjuku, near my hotel in Tokyo, which I again visited, had the same chef working. I wondered if he remembered me. Ha. During my first week, I only had sushi the very first night I was there and that wasn't such a good idea as being dehydrated and having no sleep for over 30-hours left me feeling miserable the first night there. 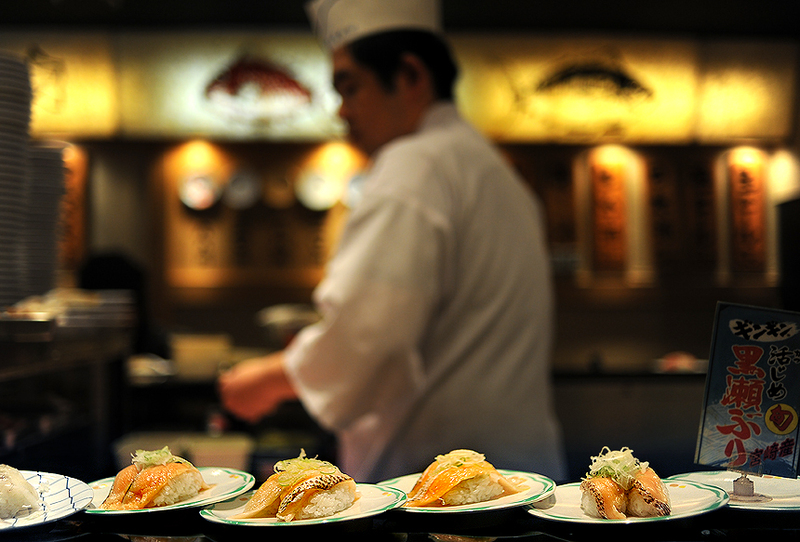 Despite that, sushi again became a staple food choice. I even had it for breakfest, lunch and dinner one day. I ate a lot of what one would call "traditional" Japanese foods. Many I had tried last time, too. Some of the pictured includes: sushi (rotating bars and non), soba, zenzai (a sweet porridge made of azuki beans) and much like it is manju (which is sweet bean paste in a pastery), pork cutlet aka tonkatsu, thick wheat-flour noodles aka udon, moche, real ramen, yakitori or grilled skewers, and many others. Now let me mention my favorite meals. Obviously, I love sushi and it's not the same in the states, but this trip I seemed to be loving the hotate or what we call scallop, especially with lots of wasabi. Mmm, I love wasabi. My absolute three favorite meals held a close ranking. First was the nabe party, which is a hot pot full of all sorts of shell fish and was homemade by my friend Yamagata san's wife. I was told it was made with some of the freshest fish from her hometown in Hokkaido. Second goes to my all time favorite Japanese street food of takoyaki. These are popular circular matters of batter, which house: octopus, tempura scraps, pickled ginger, konnyaku, green onion, and then is topped with a sweet sauce, seaweed, mayonnaise, and fish shavings. I finally got them from their origin of birth: Osaka. Third place goes to the Japanese pizza or as they call it, okonomiyaki. This was the first time I had one. These are a pan-fried batter cakes with various ingredients. In easier terms, it's a huge pancake made mostly of fried egg, cabbage, tons of fish, and bacon, then then topped with mayonnaise and sweet sauce. It's all cooked in front of you like an American hibachi grill. Delicious. Honorable mention goes to the REAL hibachi grill dinner that was cooked over hot coals in an "as-authentic-and-Japanese-as-you-can-get" restaurant. OK, so this is getting rather lengthy. Let me wrap this post up. I loved just about everything I ate, but did have some issues. Since I don't drink caffeine anymore (its almost been a year) I celebrated with joy when I found Sprite in a vending machine and in turn drank a lot of beer and water. I ate tons of rice cakes for breakfast. I tried eating raw egg in steamed rice and almost got sick 20 minutes later. Alas, I didn't get to try blow fish, again. And finally, if you didn't know, rotating sushi bars allow you watch sushi go by as you chose what you want (it can often be call merry-go-round-sushi). When you're done a waitress counts your plates and you pay the bill. Well, I should have thought of it, but I witnessed the first electronic sushi plate counter. Classic! Stay tuned for a return to some assignments I missed posting from last year, a new year of assignments and maybe one or two more posts on my trip. 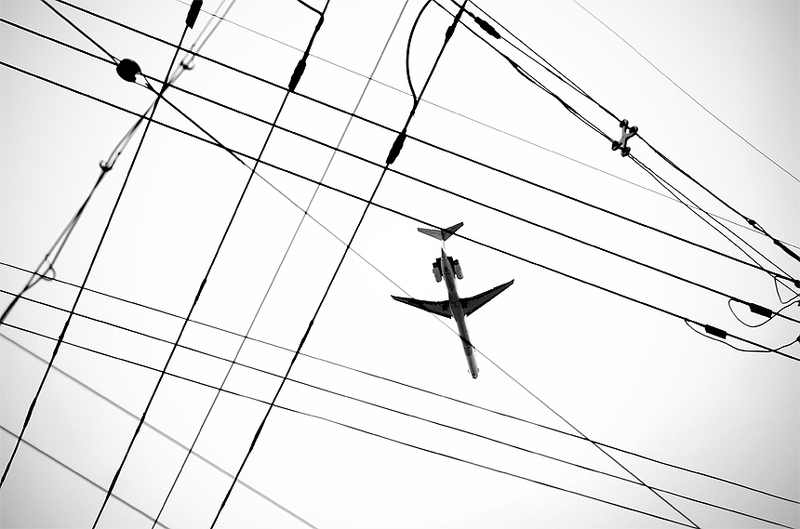 "An airplane soars over Shin-Osaka Station in Japan, Tuesday, Dec. 30, 2008." The 24-hour travel from Japan back home to Baltimore has begun. I just rolled out of bed Wednesday morning and I am beginning to gather my suitcase and cameras for the long haul home. My two week journey throughout Kyushu and Honshu in Japan has been amazing and has once again opened my eyes to: new things, new people, new places, and new ideas. I cannot thank my friends whom live here in Japan for all that they did to help me travel around this great country - whether they acted as a translator, driver or simply a friend. They made my travels much easier and a lot more fun. While I've only posted a handful of photos, I've shot more than 20 gigabytes worth of images, and about three-hours of high definition video footage. So I'll be sure to post a lot more once I get settled back in the U.S., catch up on life and more importantly, sleep. Until then, be sure to browse through my posts from the past two weeks if you haven't already since I'll probably not be posting for a couple days once back home. Please note that I'm sure the posts are misspelled and make little-to-no-sense (especially the first couple days here). Rest assure, I'll go back and fix the errors and post up some new stuff sooner rather than later. Finally, thanks for all those that sent e-mails during my travels, too. See you all back in Baltimore. It's been a great trip. 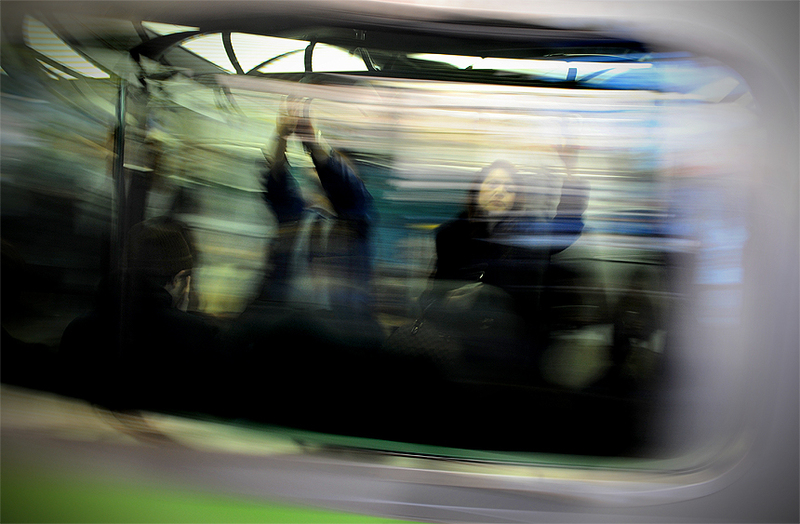 "Passengers hold on as the Japan Railway Group Yamanote Line train speeds by at Harajuku Station, Monday, Jan. 5, 2009." Coming home is never easy. Tuesday is my last day here in Japan following a two week stint and I am finding it hard to start packing up my things before I head out for my last day of running around Tokyo this morning. Going to keep it short as I want to get out and shoot some more today, so here is a brief of what we did. Most of the big things we did. Yesterday was not much different than my past day in Tokyo, other than I spent a little too much money on food. For a minute I thought I was living the Osaka life. We started the day back in Harajuku to visit the Japan Broadcasting Corporation or NHK Museum of Broadcasting. It was really cheap and feature more hiragana and kanji Japanese characters than we could really understand, but it did host a bunch of cool videos, history and photographs. The best part was a three-dimensional video that viewers didn't need any sort of special glasses. It was truly amazing. From there we walked up famous shopping area of Omotesando Dori before grabbing our first meal - expensive pork cutlet. After stuffing ourselves, we headed over to Nippori to do a long walking tour. We stumbled across a large, creepy, yet interesting grave yard and a small street market. After a couple hours there, night had fallen and we wanted one last look of Tokyo from an observatory, this time at night. So we headed back to Shinjuku to the Tokyo Metropolitan Government Building which allows visitors to get a glimpse of the city for free. Finally, we found the restaurant we had been looking for all week in Tokyo - a "real" hibachi grill. I am so glad we found it, too. From the minute we walked in I knew we made the right decision. Zero English, no pictures for ordering. A very traditional, old restaurant, it housed only five grills and it was anything but like we are used to in the States. Each grill was properly that. Five pieces of golden, red hot coals in a bed of ashes with a ancient looking mesh wiring over top. We managed to order a couple beers and an order of a $50 set meal. We weren't sure how much food this would get us, so we only went with one. One by one, our chef (a elder Japanese woman dressed in a kimono) laid down each portion of the meal: Japanese sweet azuki beans, tofu, yakitori, sashimi, vegetables, shrimp, and my favorite, scallops cooked right in their shells with sake. While very little food for two people, and very expensive, we still enjoyed the experience. I think the waitresses enjoyed our company and even called us "rich" multiple times. Ha! Finally, as we made our way back to the hotel we both realized we needed more food, so we swung into a rotating sushi bar for one last meal. Couldn't have finished the night off better than that. Well, as I said, I am rushing to type this post and really want to get out on the town one last time. I still cannot believe I'll be back home tomorrow. It's gone by too fast. 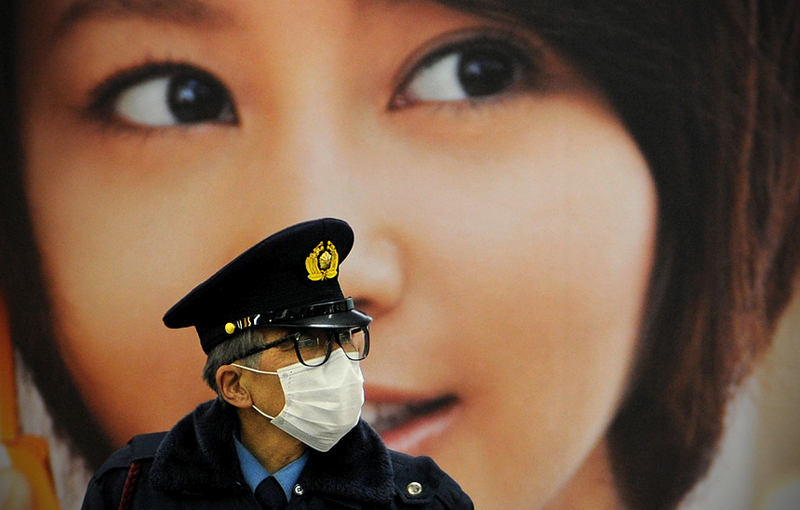 "A Japan Railway Group employee stands guard on the Yamanote Line at Shibuya Station, Jan. 2, 2009. The Yamanote line runs a circle around Tokyo and connects to it's major stations." One thing I'll miss about Japan is the ease and convenience of traveling by train. Whether it's up and down the main island of Honshu or in a circle around Tokyo. There is nothing quicker, timely and efficient as these trains and subways. Being back in Tokyo, using the Yamanote Line is by far the best way to get to each major hub of the city. Making a complete circle, it's impossible to get lost or redirected to another train and it takes about one-hour to make a full loop. Although there are many other railway lines and subways that can seem complicated and sophisticated, they are not as nearly as hard to figure out with the help of English subtitles under the Japanese characters. Aside from the ease of travel, yesterday we used something other than trains to get around - our feet. The only down side (other than feeling exhausted after eight-hours or more of walking) of Sunday was not being able to see anything we wanted to see. First, the Tsukiji fish market, which some call the the biggest wholesale fish and seafood market in the world. I wanted to visit last trip, but it was closed for the holidays. Well, although it wasn't a holiday this year, it was now closed again due to all tourists being prohibited. Apparently, bad behavior among visitors prompted the Japanese Government to ban non-workers during their most busy time of the year. Dang! So instead, we started off going to Harajuku where apparently every Sunday teenagers dress up as their favorite animae and manga characters and then dance and do other things. In basic terms, they wear wild costumes. But we only saw one or two and they seemed to be packing up. I think we missed it. We also wanted to see a real sumo wrestling match in Tokyo, but again, each month they have a 15-day tournament, and well, this month's doesn't start until next week. To fill all out voids, we went shopping and browsing a couple other areas of Tokyo for a couple hours. We saw pretty much everything from the high end, Manhattan type stores to the little, funky boutiques. In addition, we hit up electric city, which hosts and sells just about anything and everything electronic. From wires, cables and toys, to cameras, televisions and crazy lighting. They have it here. Well, we are running a little late out of the door this morning. It's about 9:30 a.m., local on Monday. 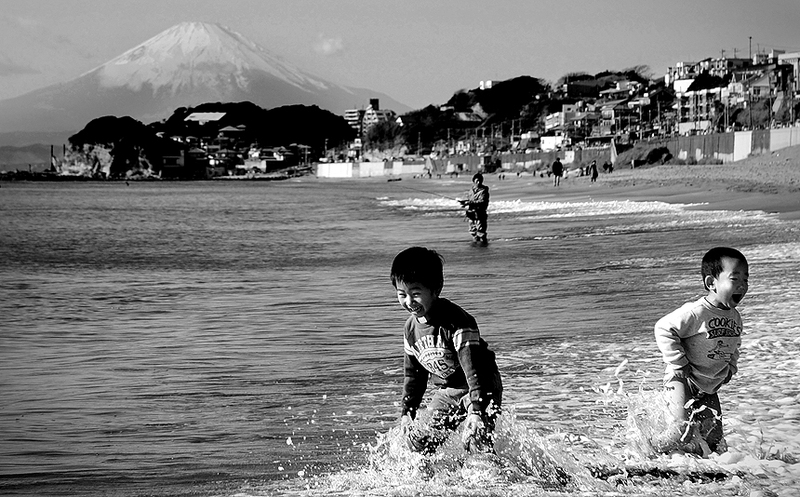 "Children splash and play in the clear waters of Shichirigahama where onlookers can spot Mt. Fuji in a far distance near Kamakura, Japan, Saturday, Jan. 3, 2009." Saturday was one of those days that make me realize that I love Japan. I said it last year, and I'll say it again, if the rest of my week would be boring, I'd be OK with that knowing today was such a great day. Although it started early, we managed to get to Shinjuku Station on time to catch our 8:00 a.m. JR train to Yokohama where we'd meet up with friend Vivo san. From there we moved to Kamakura to see some temples and shrines and basically walk around. We saw the ginormous Amida Buddha and other fascinating places. The Buddha at the Kotokuin Temple we saw was the second largest bronze Buddha statue in Japan. On our way back to the JR station, we passed the ocean and could see some surfers in the distance. Vivo san decided to get off so we could check out the beach and I was pumped for that. Then as we closed in on the sand and waves in Shichirigahama, to our right sat Mt. Fuji in a far distance. It caught me off guard to see it, let alone in sight of a beach. This was a great sight, not to mention kids playing in the clear waters made my environment more surreal. Whomever invented grilled chicken skin yakitori should win an award. Truly amazing. On the other hand, the one skewer of guts (which had the texture of a rubber hose) should not. Nonetheless, it was tasty to some degree. After that, we roamed Yokohama inducing Yamashita Park and the highest skyscraper in all of Japan - Yokohama Landmark Tower. It stands near 1,000-feet tall and is host to the world's second fastest elevator. Following our long day walking around, we met up with Ootsu san and went to see another friend I made last trip, Yamagata san. At his home, his wife and him held a nabe party in our honor. She lives in Hokkaido and had some fresh fish sent down for the new year, so she made a stew of these combined together along with a large portion of sushi. One word. Delicious. This home cooked Japanese meal blew away every "real" Japanese food I've had yet. I've never been so satisfied with a meal. I cannot thank them enough for allowing me into their home, cooking us a wonderful meal and making this return trip to Japan so enjoyable. I had a blast at their home and never wanted to leave. We will be in Tokyo for the next three days before making our way back home. I really don't want to come home. "Various types of sushi rotates in front of customers at a restaurant near Shinjuku Station in Tokyo, Japan, Friday, Jan. 2, 2009." The Japan travels continue and when I say it was a travel day, what I should really say is that it was a sushi day. Let me first preface by saying I've been shooting a ton each day (roughly 4 GB a day or more) and I am really having a hard time editing down to what I'll post for the day. I have many images that I love so far, some that tell the day in one picture better than others and others that are merely "snap-shots" that will help me remember the place I have been. In addition, I want to post my best of the day, but at the same time I am waiting to put some up until a later time. So just be prepared to see more images later, just not now. We'll spend our last week in Tokyo before heading back to the United States, but had to get there first. Thus we took the JR Shinkasen north Friday morning. After checking out of our awesome hotel in Shin Osaka, we jumped on the train and luckily had no problems getting a non-reserved seat on what we thought would be a busy travel day into Tokyo. During the three-hour train ride we first were amazed that it was snowing heavily roughly 20 minutes from Kyoto station. We started seeing snow atop small mountains, then as we got closer were in a complete snow storm. About an hour later, we were again in blue sky, sunny weather and staring at Mt. Fuji. Last trip I got an up and close view of Japan's largest mountain, this time all I got was a passing view. By the time we got to Tokyo station and switched to the Yamanote line to take us over to Shinjuku, and then make the nearly 10 minute walk through the streets, we were back at the Shinjuku Washington Hotel. At this point we were exhausted from sitting around all morning, so we checked in and then got some quick sushi near the station with hopes of a real hibachi dinner. We then roamed Tokyo until 8 p.m., including Shibuya, which is famous for its mad scramble, dash intersection where I have heard that 400 people cross every time the light changes. I am not sure if that's the case, but I got a chance to see it from above this time and was just as impressed as last time I saw it from a bird's eye view. I am pretty beat right now, fighting to keep my eyes open. Tomorrow we will meet back up with Vivo san and then head to a nabe party at night. I am super excited! 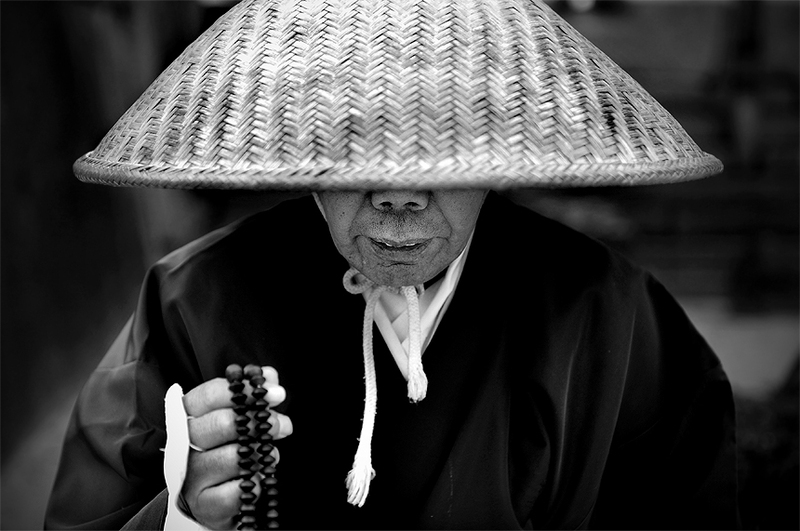 "A monk chants a prayer for donating passerby outside the gates of the Osaka Castle on Jan. 1, 2009." There is a saying that if people from Japan were given a large amount of money that those from Tokyo would spend it all on shoes and clothes, while those from Osaka would spend their money solely on food. Well, I kept that in mind on News Years day as I wondered Osaka alone all day. Starting off the day was different to begin with since it was New Years Day. Since being in Osaka I've been eating the hotel 800 Yen breakfast that is a traditional Japanese meal. And as I mentioned it being New Years Day, a special meal was in order. It's hard to explain, but "little fish" as they call them, a piece of smoked fish, pork, pickled vegetables, soup and rice dumplings were a part of it. Almost the same as what we've been eating with a little different items. After gobbling up my first meal, we grabbed the circle line train (this was it was impossible to get lost) in Osaka and hit up the Osaka castle first. As I often mention with these ancient structures, it was amazing, but a bit disapointing since the inside was closed. I made up for that by getting some street food - yakitori - or otherwise known as a skewered meat, chicken or fish. On the way back to the train it started to rain, so we opted to try hittingup the aquarium or kaiyukan, which is one of the largest public aquariums in the world. Well, my map showed where the aquarium was (in the bay area of Osaka) but it stopped a good two miles off the map. Since this was unknown, we hit the southern most part of the Osaka circle line and started walking south west. Roughly 10 minutes later I was using my best (read: worst) Japanese to get some help. Finally we got some help and when I asked if it was in walking distance a younger guy about my age said "far, far" which I took as no. We then decided to grab a cab and things didn't get much easier or cheaper to say the least. Eventually we found it and it was totally worth it. But before going in we grabbed some udon noodles and dessert. On the inside, all the typical animals and fish, but it had a good amount of stuff I've never seen including a ginormous whale shark. It was fascinating. After that, we found a subway/train station and put the old myth to the test of Americans cannot use them. It was actually really, really easy and we found our way back to Yodobashi and Umeda with no issues. We tried to get into some crazy arcade in Umeda, but it was closed, so we hit up the famous food area in Osaka. Since we've had a large variety of food in this trip so far except sushi, we grabbed some that would have cost more than three times as much in the United States. Each plate at this rotating restaurant was 100 Yen. At home, the fish would have easily been $5 a plate. You do the math. We finished the night walking around and then I had to have one of my favorite meals before heading home for the night - takoyaki or fried octopus balls. Mmm. Back to Tokyo for the remainder of the trip, although we have two more days on our JR passes, so that may change.